It's been a blast! Together we cut vegetables in Brussels, cooked soup and served it the european ministers for agriculture. We thank all WeMove activists, without you such great actions would not be possible. We call on you to support a sustainable agriculture that is fair and healthy for producers, consumers and the environment, and humane to animals. It is time for governments to put the public interest before that of big business. We urgently need a fundamental reform of the Common Agricultural Policy. The European food and farming system is broken. Across Europe people are coming together to call for change. We want a food system that is fair, healthy and good for people, animals and the planet. The time to act is now as governments across the European Union (EU) negotiate the future of the EU’s Common Agricultural Policy (CAP). Rules that determine the future of farming and how vast sums of taxpayers’ money (currently around €60 billion annually) are allocated will be agreed. Current rules mostly benefit industrial farming and food production, fuel climate change and pollution and cause nature loss and animal suffering. Big corporations, profiting from these rules, are thriving while small-scale and environmentally-friendly farms are disappearing. And people are suffering: while 50% of the population in Europe is overweight, an estimated 33 million people are at risk of malnutrition, with 43 million of the EU-28 population not able to afford a quality meal every second day. A fair CAP, delivering fair revenues to farmers that cover their costs of production and decent working conditions both for farmers and farm workers. It must reward those who make a transition to sustainable farming. It must promote local producers over global corporations, minimise resource use and prevent the exploitation of people in developing countries. The current per-hectare farm payments must stop and be replaced by targeted funding and support that promotes the transition to a sustainable society. The CAP must not harm food production capacities of small-scale food producers in Europe and in developing countries. Trade-distorting CAP measures that lead to the destabilisation of markets at the local, national, European and international levels must end. A green CAP, halting biodiversity loss, minimising the use of pesticides, fertilisers and antibiotics, ending intensive livestock production, reducing waste and radically cutting greenhouse gas emissions. It must promote a resilient and diverse food and farming system, and provide at least 50 percent of CAP funding for measures that protect and promote nature, the environment and climate. A healthy CAP, prioritising healthy, nutritious, seasonal, local and affordable diets with fresh fruits and vegetables, and makes these accessible for all citizens. It must support legumes and promote the consumption of less and yet better meat. It must take care of people, animals and our planet. A CAP for the people, spending public money on public goods. It must serve communities and consumers, and not corporations. We demand that the so-called strategic plans of the CAP are developed in a participatory way, with local authorities and civil society organisations. They should explicitly seek the participation of farmers that are willing to embrace the transition towards sustainable farming and enable the participation of small-scale farmers and their organisations. The goals of a fair, green and healthy CAP are universal, which is why we demand that all Member States deliver on the entire set of objectives set by the new CAP. These objectives need to be supported by impact indicators that allow setting specific goals and track performance. Funding to Member States and farmers must be conditional upon achieving the objectives. We need binding safeguards prohibiting the use of interventions deemed harmful for the environment, animal welfare, the rights and health of small-scale farmers and workers, and which have adverse external effects, coupled with a binding and purposeful accountability and monitoring system. Those that break rules should not receive public money. 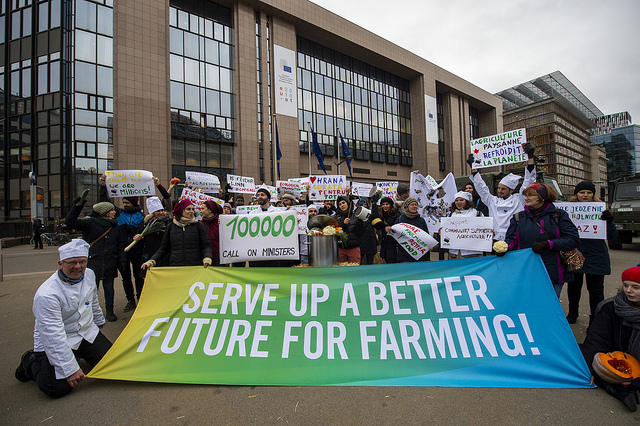 We trust and believe in European solidarity, and call on governments to share our enthusiasm to create a better and sustainable food and farming system. Fair prices support a proper balance for people and planet; doing business good... We need to balance our grow to the limits of our planet. Ecology vs economy. If we don’t act now, this planet can not be home for our children and their children anymore. We already feel the consequences now, there is not much time left to do something, so let’s act now! Sono molto sensibile a questa iniziativa perché ciò è alla base della salute della persona e dell'ambiente. Industrial farming kills bees with pesticides, it over-fertilises our fields, and tortures animals in factory farming. Subsidised with billions every year from Brussels! Next year the money will be completely redistributed – and now is the moment when this massive change is discussed by politicians. Starting now, we will mobilise for Europe-wide days of action, we will organise a protest in Brussels and get our voices heard. Please make this happen with your contribution. Every amount counts. To stay independent, we are very careful about who we accept money from - but impactful campaigns need funding, so we need your help! 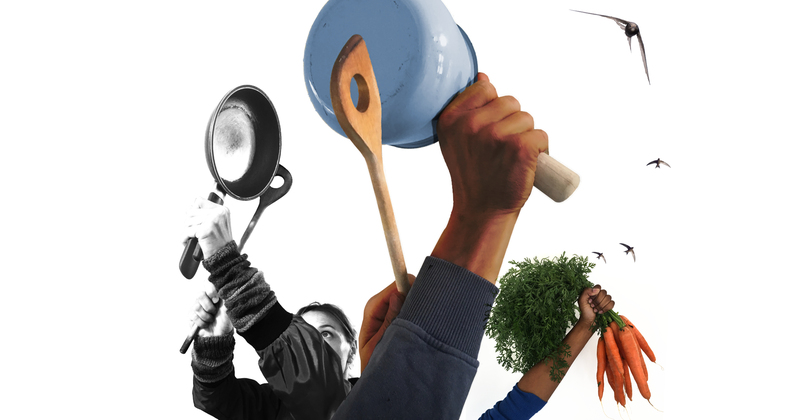 Can you donate just a few euros a month to help our community continue working for good food good farming?